Specially designed stainless steel handles are triple riveted for security and durability. 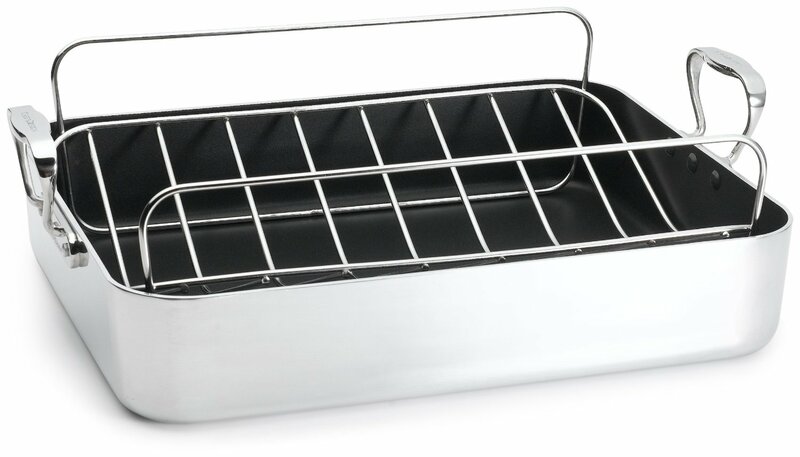 Together with the included heavy-gauge, stainless steel wire roasting rack, they create a unique roaster that offers exceptional function, beauty and value. • Premium non-stick interior in roaster. • Heavy aluminum roasters will not warp, and they transfer heat evenly and quickly. • Polished stainless steel handles on roaster triple riveted for security. • High sides keep splattering to a minimum. • Roaster works equally well in the oven or on the rangetop. • Roast foods in the oven then place roaster over a burner to reduce cooking liquid for sauces. • All handles are oven safe.